Yesterday evening, my mom and I (Joel) walked along Old S. Saint Vrain Road just outside of Lyons. There is a side creek of the Saint Vrain River that flows into a little pond. I noticed some movement at the creek's edge, looked more closely, and saw a Virginia Rail!!! The only time I have seen this rail species before was on a rail walk in Texas last year where we got fleeting looks as they flushed up. 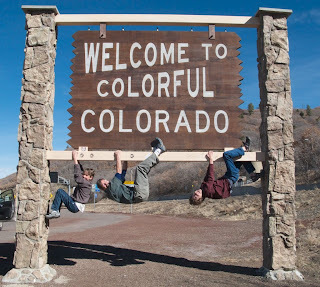 In Colorado, I had previously only heard them. This rail was very close (~10 feet) and I was able to clearly observe its field marks . . . fist-sized body; long, decurved bill with lower orange mandible; gray face; faint rufous underparts; faint black and white barring on flanks; flicking, up-cocked tail; and yellow-orange legs with very long toes. 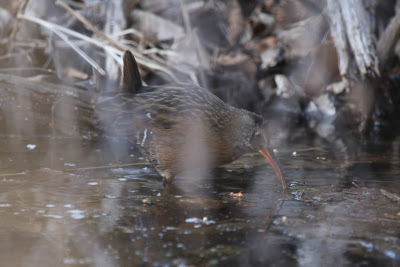 The Virginia Rail quickly walked right through a densely packed stick dam. Rails look chunky, but they really are "thin as a rail!" I needed to photograph through some dead branches, which is why there are blurry streaks. It's a time of transition. 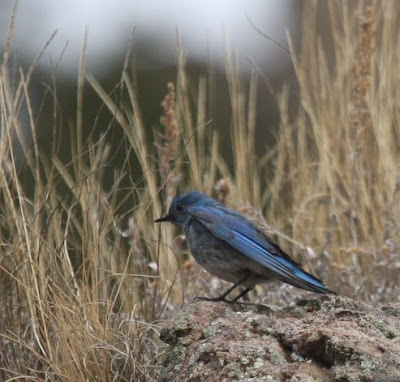 In our neighborhood, Mountain and Western Bluebirds are back in plentiful numbers! Winter birds are still numerous. 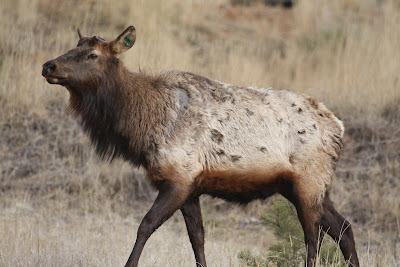 Some of the elk have dropped their antlers, while some still sport them. 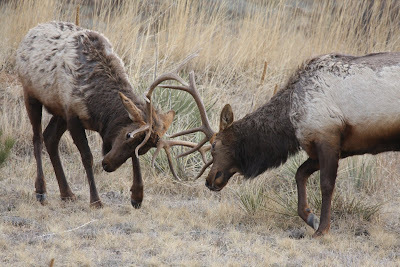 On the other hand, all of the Mule Deer are antler-less. We arose at 5:45 AM to get a bite to eat and be out at Las Vegas National Wildlife Refuge by 6:40 AM. The geese were absent at their usual roosting lake, so we figured they’d flown earlier than usual or had roosted on some other body of water or had decided to move on north last night. 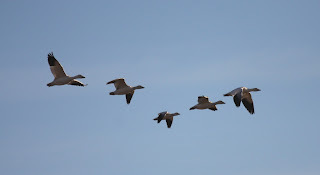 We scoped the waterfowl on Crane Lake and then suddenly noticed a mass of flying white geese to the northwest. 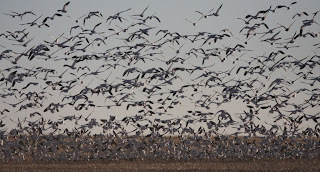 We headed that direction and found Snow and Ross’s Geese feeding in a freshly harvested field. Along with them were some Sandhill Cranes, some of which were “dancing!” After a while, the geese rose up together in flight to descend over to yet another feeding area. What a sight! 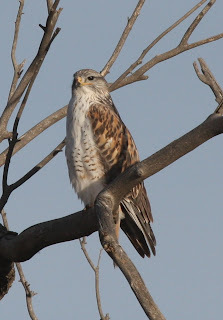 We also saw some Ferruginous Hawks at this preserve and our first Black-billed Magpies since leaving home! 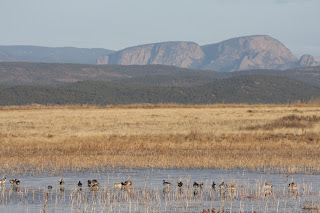 Our last birding stop of the day was Maxwell National Wildlife Refuge south of Raton, NM. Notable here was our first of year Mountain Bluebirds. 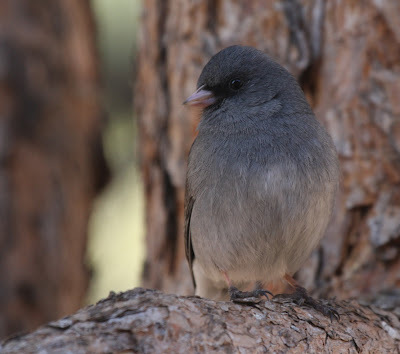 When we eventually arrived home around 3 PM, we noticed that the Mountain Bluebirds had returned to the higher elevations in our absence!